As part of the newest fleet of catamarans in the Galapagos, the 113-foot Ocean Spray features a variety of cruise itineraries for every type of traveler. From four-day jaunts to 15-day mega-cruises, this first-class vessel has something for everyone. The Ocean Spray blends adventure travel with the comfort of a luxury hotel. Accommodating 16 passengers in nine cabins, it offers striking blue-and-white decor, gorgeous indoor and outdoor public areas, and an 11-man crew that teaches snorkeling and kayaking—as well as a naturalist’s appreciation of the islands’ marvelous wildlife. The Ocean Spray features one single and eight double cabins, spread out over two decks. 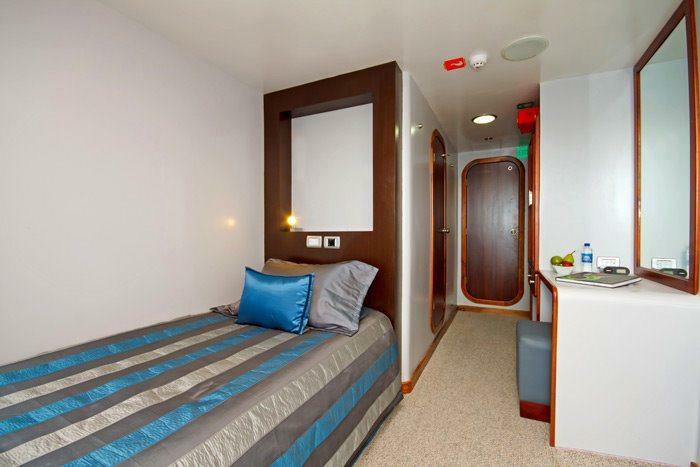 Each cabin features your choice of one queen or two twin beds, private bath with hot and cold water, nautical-themed décor, and individual climate control for your comfort. As you enter the island currents, you can also gaze through the panoramic picture windows at the marvelous flora and fauna, or sit out on deck chairs on your private balcony to feel the tropical breeze. The catamaran’s social areas allow you to get to know your fellow travelers in settings that promote relaxation and friendship. The al fresco dining area is the perfect setting to enjoy international cuisine while watching the sunset, while the Jacuzzi embedded in the all-wood deck is the perfect place to ease your muscles after a long hike. The Ocean Spray offers other amenities as well. An on-board library allows you to learn about the Galapagos’ fascinating ecosystem, while talks by the resident naturalist promote awareness of the islands’ special history. And in the evening, when you want to celebrate, you can do so in style in the vessel’s commodious lounge. The perfect platform to experience “Darwin’s islands” with a select group of friends.